The most common way of looking at fatwas, as authoritative religious solutions for individuals pertaining to various aspects of life, does injustice to one of the most common manifestations of fatwas, fatwas as a social phenomenon. Most of the historical fatwas we have at hand, rather than being confined to the individual sphere, pertain to two or more people, and sometimes entire communities. Thus, this paper emphasizes the social dimension of fatwas. Based on an examination of Ottoman fatwas it specifically discusses whether looking at fatwas as some sort of a space, similar to public space, is a viable option. Dr. Ertuğrul Ökten received his PhD at the University of Chicago, and currently teaches at the Department of History, Istanbul 29 Mayıs University. 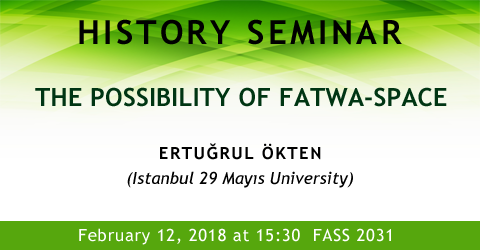 He focuses on the intellectual, social and cultural history of the late medieval and early modern Islamic world, especially the Persophone and Ottoman spheres.